Big news yesterday as the Finance Minister Duncan announced the Ontario Clean Energy Benefit (OCEB), which will bestow a credit of 10% of our bill upon us. The release by the government indicated the move to cleaner energy has been expensive, and would be so for another 5 years, so this should alleviate some of the pain being felt due to this noble endeavor; "Over the next five years, residential electricity prices are expected to rise by 46 per cent, after which price increases are expected to moderate as Ontario will have largely completed the transition to a cleaner, more reliable system." I'm skeptical. Somebody said if you want to know where you are going, you need to know where you are, and where you've been. Seems like a good time for a big picture overview, a review of the current price drivers on the consumer side, on the industrial side, and to take stock in whether the government has any credibility in implying there is a planned destination, and a plan for arriving at it, in 5 years time. A lot of information I've found, regarding the history of Ontario consumption, has disappeared off the web. The Conservation Bureau had some excellent information which seems to have been buried as it was swallowed up by the OPA. Similarly, one could find Hydro One's "Providing the Balance of Power" scanned in, but now I only find references to it, such as in this document prepared for Pollution Probe. 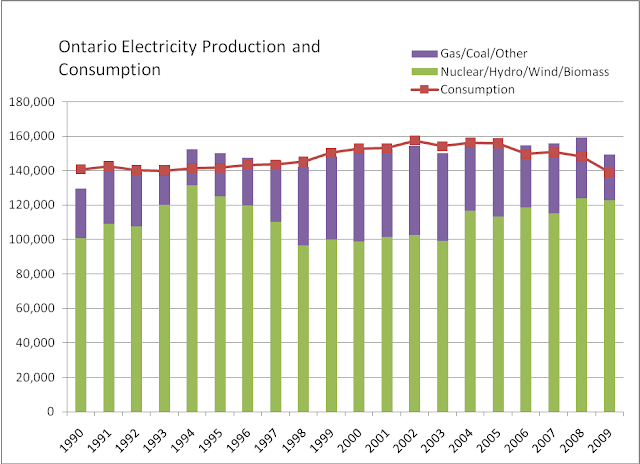 The point I'd make is that by 1990 the Ontario Hydro forecasts from 1989 were well ahead of the actual demand – and demand in 2010 is far below the lowest end of the forecast range from 20 years ago. That looks like a trend to me. Annually from 1990 onward we'll see the overall consumption trend. I've also broken up supply in terms of production of GHG's – illustrating that if the argument is we need to save the world from global warming, we've had a higher volume of emissions free electricity supply in the past. The other note, about the emissions free supply, is supply has exceeded consumption each time we've ramped production of nuclear/hydro/wind/biomass to over 120 TWh. There's a reason for that I'll get to another time. In 1990 you see the most significant gap where supply failed to meet demand, but that gap in 2003 figures prominently in the current liberal narrative about the whole thing being a mess when they came to power (it's a good thing Bob Rae is a Liberal now or he might be saying something about what Peterson left him!). On the other hand, you can see the current oversupply looks very similar to the situation in 1995, which Rae left to Harris. The earliest forecast I find from McGuinty's first term is the ISO (now the IESO) 10-year forecast in 2004 that predicted anywhere from 24702 – 26400MW for peak demand in 2010, and it was 25075MW (although that was the highest in 3 years – the previous 2 years peak summer demand was below the low growth scenario from 2004). So we are far below expectations from 20 years ago, and also below expectations from 5 years ago. The OPA (Ontario Power Authority) was created by McGuinty, and one of its tasks was to complete an Integrated Power System Plan. The IPSP process has been a farce, primarily due to politicians meddling with directives and mood-changed induced redirection, but in their IPSP submitted to the OEB in 2008, the OPA shows (on page 7 of 34) peak demand declining through 2015. That chart shows this year's peak should have been around the 25000MW it was, and peak drops to about 24250 in 2015. A chart to demonstrate that peak, average, and minimum demand values tend to move in tandem. You can spot the years with exceptionally hot days in the chart, but overall the trends are the same. 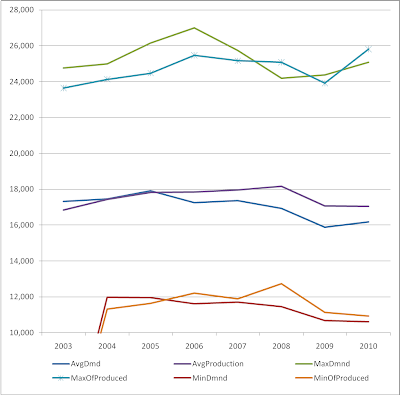 I'll include the same figures for production, and I'll note the focus of the OPA on peak reduction isn't reducing peak as quickly as the average (or annual) consumption is changing, nor is it declining much differently than the minimum demand. So this is where we are. Settled into a gentle downward trend in demand, whether peak or average or minimum, that dates back as a decline to around 2002, but much further as a trend (previously as a reduction in the rate of increase). Nobody seems to be predicting increased usage for 2015, and the delivery system is now handling the same volume they did 2 decades ago. And we seem to have adequate supply both in general, and for peak demand. In fact, we have a 5-year trend of production outpacing demand now. That sounds like it should deflate the price of supply to me. The IESO does have an Hourly Ontario Energy Price (HOEP). This was designed for a competitive market as the price that is charged to "local distribution companies (LDCs), other non-dispatchable loads and self-scheduling generators." It would also be the motivation for suppliers to crank up the supply – in a competitive market. But reviewing all this data back to 2002, one can see we started without adequate supply, and then the Eves government froze the price, and potential suppliers appear to have lost interest. 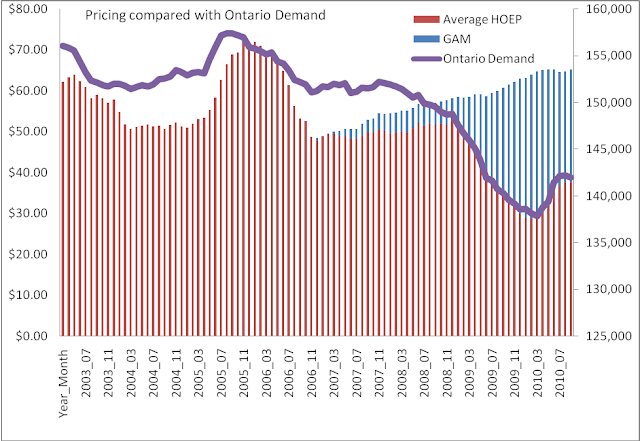 This graph clearly shows that since 2007 the only driver of per watt price increases in Ontario is the contracting of supply at greater expense (note the HOEP does match the demand curve quite closely). That's the current situation explained for the large consumers of electricity in Ontario on the Wholesale rate. That rate plan, which I believe covers about 45% of consumption, had other charges totalling 1.96 cents/kWh in October 2010 – the exact same amount shown on the IESO monthly report for October 2003. For residential and small business consumers, the case is very different. For us, we now likely pay over 17 cents/kWh once all fees and taxes are included, and that's likely double what was paid when Eves froze rates. Your cost per kWh is likely up around 50%, but your cost for the services in getting that watt transmitted to you are up 200% in that time. While popular discussion centres on wind and solar FIT rates, nuclear and gas contracts, etc., and I've demonstrated there is inflation entirely due to this government's contracting, the public utilities continue to rifle rates forward on the transmission side. To transmit the same volume they did 20 years ago. "Over the next five years, residential electricity prices are expected to rise by 46 per cent, after which price increases are expected to moderate as Ontario will have largely completed the transition to a cleaner, more reliable system." Did anybody remember they've never had a plan? Perhaps this program was to alert us the IPSP, or LTEP as it may now be called, is delayed until 2015. My spouse and I stumbled over here by a different website and thought I might check things out. I like what I see so now i'm following you. Look forward to going over your web page again. presents these stuff in quality? Hello there, You have done an excellent job. I'll certainly digg it and personally suggest to my friends. I'm sure they'll be benefited from this web site. There's certainly a great deal to learn about this subject. I like all the points you made. Do you have any video of that? I'd want to find out more details. will without doubt take good experience. I'd like to thank you for the efforts you have put in penning this blog. I'm hoping to check out the same high-grade blog posts from you in the future as well. Quality content is the important to interest the people to pay a visit the web site, that's what this site is providing. Hi it's me, I am also visiting this web site regularly, this website is genuinely pleasant and the viewers are actually sharing pleasant thoughts. Hi to all, it's truly a fastidious for me to pay a quick visit this website, it contains important Information. You cann't imagine just how so much time I had spent for this info! Thank you! nice paragraph, keep it up. magnificent. I really like what you've acquired here, really like what you are stating and the way in which you say it. You make it enjoyable and you still take care of to keep it wise. I can not wait to read much more from you. This is really a wonderful website. I have a blog centered on the same information you discuss and would love to have you share some stories/information. I know my viewers would appreciate your work. Hi, i believe that i noticed you visited my web site thus i got here to go back the desire? tаsk with this сontent - so much so, I have discussed it witth my social-network. say how they believe. At all times go after your heart. My brother suggested I may like this website. He used to be totally right. This put up truly made my day. You can not believe just how a lot time I had spent for this info! so one may feel hungry when they are not supposed to.